I might call my blog “The Anime Almanac”, but it is not really an almanac, an extensive reference book of general anime information. Such a thing does not really exists in written form, at least not in English. But there actually exists a manga almanac that came out late in 2007. Jason Thompson and a group of manga enthusiasts put together Manga: The Complete Guide, a book containing reviews and information about every single manga series ever released in America at that time. It is one of the most impressive books to have ever hit the American manga industry. So now the man who (literally) wrote the book on manga in America is entering the genre himself with King of RPGs, the brand new OEL series that Del Rey will be releasing this month. Shesh loves his MMORPGs. I mean, he really loves his MMORPGs, like dangerously loves them. And after a seven day marathon of “World of Warfare” left him hospitalized with months of therapy, he was forced to give up on his obsession cold turkey. But on his first day after moving into his college dorm, he and his pal Mike are coaxed into giving tabletop role playing a shot in the school’s gaming club. But after a few rolls of the die, all of those old feelings begin coming back to Shesh. Before you know it, he has turned back into the King of RPGs, an unstoppable (and potentially dangerous) force in all of gaming. Although I have been around a ton of geeks who play RPGs, I have never gotten into role playing culture myself. I’ve never roll the die in Dungeons & Dragons, played my deck in Magic the Gathering, or do… whatever the hell you do in those Munchkin games. But that didn’t stop me from absolutely loving this comic. Thompson’s story subtly draws on the very popular shonen franchise Yu-Gi-Oh!, which means “King of Games” in Japanese. Along with featuring a gaming protagonist with a split good-and-evil personality, both comics also make the fantasy worlds of the games “come to life” through the magic of manga storytelling. As the characters engage in gameplay, the story seamlessly jumps between the setting of the group playing around the table to the setting of the game’s story, complete with all the characters dressed up as their gaming persona. However, Thompson’s comic ends up feeling more like the online video series The Guild than Yu-Gi-Oh! because it does not focus on the games, it focuses on the people who play them. A majority of the volume is spent in the real world where all the characters live out their normal lives, but they form bonds and friendships based on the opportunity to play more RPGs. Here is a group of American nerds doing the type of things that American nerds do best – totally geeking out and having fun while doing it. Because of this, the average American manga reader will find themselves able to relate to the story very well even without ever playing an RPG in their entire lives. On top of all of this, you have a really funny book with a lot of great nerd-related humor. The “real world” antics of his characters often get as wild and as exaggerated as the games they play. There are plenty of parodies and riffs on real-life tabletop games, video games, anime, manga, and just general nerd culture. And Thompson even manages to make a very good observational joke on anime cosplayers and people who dress as gothic vampires that will really get you thinking. But there is a major sticking point with King of RPGs, and that is the artwork by Victor Hao. This is Hao’s first published comic book, and it feels like the work of an amateur web comic artist. The images are too overdone with digital retouches. The perfect solid lines and massive amounts of digital screen toning takes away all heart and soul out of the artist’s drawings. And the heavily Americanized character designs feel more appropriate for Archie comics than Del Rey Manga, particularly in the facial expressions. I also had a problem with how condensed the dialogue was in this story. One of the major difference between American and Asian comics is that you breeze through Asian manga far more quickly because the dialogue is so brief. 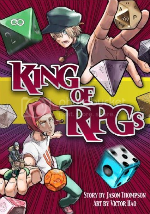 There is no breezing through King of RPGs, it will take you quite a while to get through. I felt like I spent a week just working my way through the first chapter, and it became very draining and began taking away some enjoyment from the story for me. I could understand this being a good thing for some readers, like they are getting “more bang for your buck” by fitting so much story into these pages. But if you are the type of reader that is used to the pacing of Japanese manga, prepare to spend a little extra time with this one. But nitpicking aside, King of RPGs is such a wonderfully done comic, and it really should be on everyone’s “must read” list. It probably only ranks behind Dramacon as being the best OEL manga ever published here in America. Manga fans would probably take the genre far more seriously if there were more series of this quality out there. The Good: A freaking hilarious and well written story that manages to speak volumes to our American nerd culture. The Bad: Bad digital artwork and a little too much dialogue. Final Verdict: For his first venture into OEL territory, Jason “King of Manga” Thompson strikes gold with his King of RPGs series. Read it! This entry was posted on Thursday, January 7th, 2010 at 2:23 pm by Scott	. A manga review without a single art example ? Thats somewhat ridiculous, dont you think ? I don’t think so. Del Rey doesn’t provide us samples and any image I try to scan in is going to look crappy with the book binding and all. Besides, I don’t think ANN or Mania include art samples in their reviews either. It’s takes too much time to do. I think the cover is just enough art for a manga review. Seriously, he talks about the art in as much detail as it can possibly be without it becoming a *technical* review of everything in the manga. Now I really have to check this one out. It’s relevant to my interests!